When you are looking to invest in a high quality cookware set, you really can’t go wrong with copper. It cooks exceptionally well, looks fantastic, washes easily and will ultimately save you money in the long run. Copper cookware today is usually available with a variety of other metals, the most popular being a stainless steel and copper combination, as the stainless steel is easily cleaned. One such set is by Matler. 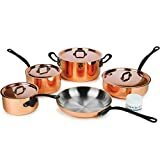 Below we offer our Matfer 915901 8 Piece Bourgeat Copper Cookware Set Review. The following are the most features of Matfer 915901 8 Piece Bourgeat Copper Cookware Set. The beautifully presented thick red copper, is an impressive 2.5mm thick. 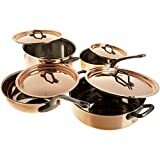 This is a lot more substantial then other copper cookware sets that are on the market, and this is reflected in the price. It allows for professional grade cooking that gives you even distribution of heat while cooking with no burning or hidden hotspots of food. The copper exterior will not easily warp or damage over time and is very easy to clean and to keep sparkling new. Stainless steel is a smooth and safe surface for cooking, as it will not tarnish food nor interfere with its taste. There is no need to re tin the lining of the pot years down the line, as you often have to do with other copper sets, as stainless steel is incredibly hard wearing. The stainless steel which is an 18/10 construction, will wear well, is easy to clean and is very safe to use. The inside of each pot and pan is also guaranteed to have its own highly polished look maintained just as the outside of the pot. The cast iron handles have heavy duty rivets making the cookware feel extremely sturdy and safe to manoeuvre around the kitchen. As they are incredibly sturdy, they help to counterbalance the weight of the pan helping to avoid tipping them over while in the process of cooking on the stove. The handles are also smooth and firm to the touch and are very easy to grip without placing any extra pressure on the arm. They also remain cool to the touch when used on the hob. 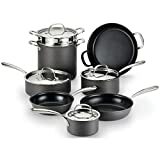 This set includes 8 pieces of cookware. They include a 9.5 inch casserole pot with lid; a sauce pan with matching lid; a saute pan with lid and an 11 inch brazier pot with matching lid. Therefore there is every size of pot you will ever need to cook in, plus an accompanying tight fitting lid. You can therefore cook a family meal including meat, vegetables and accompanying sauce. All cookware is suitable for oven use, and is safe to use under a broiler. The set comes with 4 copper lids that accompany the matching size pot. Each lid is made of thick copper and has a firmly attached handle that makes lifting the lids on and off the pot incredibly easy. The lids fit securely with no gaps once seated. The securely fitting lids seal in moisture while cooking and help to speed up the cooking process. The lids although sturdy are not too heavy and easily manipulated. Their smooth surface is also really easy to clean. Good conduction of heat, cooks food thoroughly. Beautifully presented in its red copper color. Q. Is the cookware oven safe? Q. Do the cast iron handles have a protective coating? A. Yes the handles do have a protective coating. 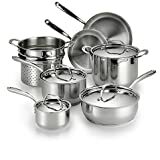 If you are looking for a high end, high quality cookware set, then copper is always a good choice. The Matfer 915901 8 Piece Bourgeat Copper Cookware Set although expensive will last you a lifetime. It cooks to perfection, is easy to clean and looks fantastic in any kitchen. Everyone loves the look of red shiny copper. If you want a cookware set to invest in, then this is the one to buy.